Aaliyah Pitts (28 points) jumps in the air to harass an Osbourn Park in-bounder in the second half Monday night. 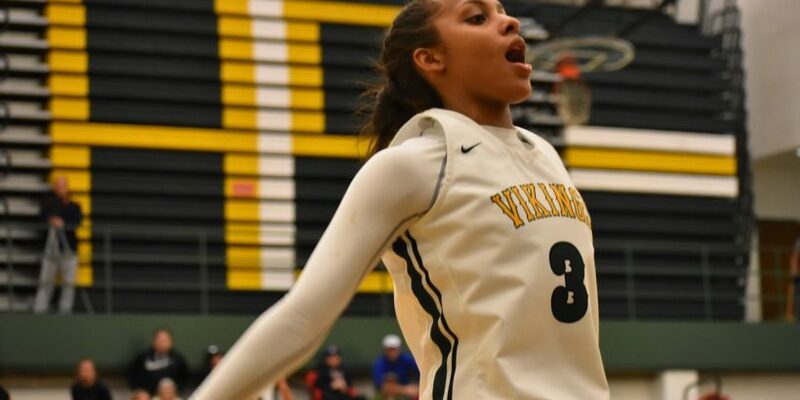 Aaliyah Pitts scored 22 of her 28 points in the second half and Woodbridge’s pressure defense forced turnover after turnover in the third quarter as the #3 Vikings defeated #7 Osbourn Park, 63-56. 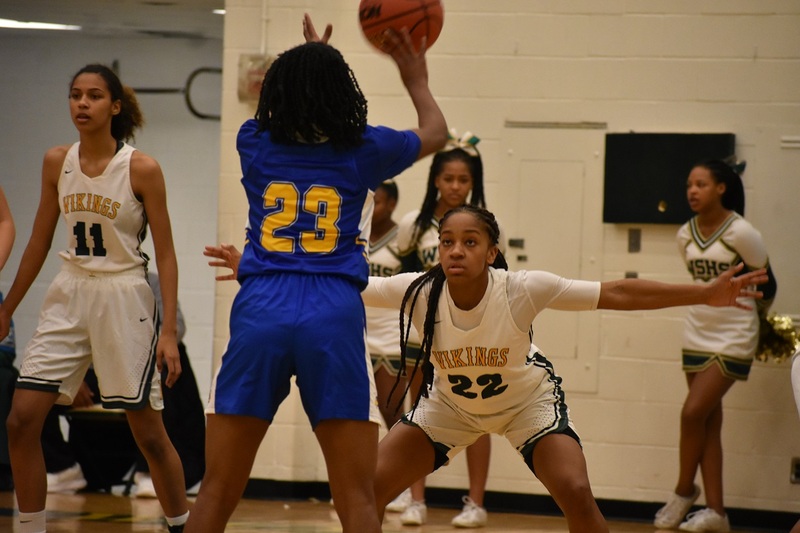 It’s not like Woodbridge wasn’t playing defense in the first half–Vikings forward Adaija Bender had three steals alone in the first quarter–but Woodbridge wasn’t scoring enough (down 27-25 at half) and thus there wasn’t much of the full-court pressure the Vikings are known for. That changed in a hurry as Pitts got hot and Woodbridge applied its patented full-court press. It did throw the Jackets off a bit. They committed a ten-second violation, they threw the ball away, they let Woodbridge take the ball from them. Meanwhile Pitts caught fire, often scoring off feeds from guard Tae’lor Willard. She was deadly from the arc, connecting on four-of-five three-pointers. Still, Osbourn Park kept the game close after relinquishing the lead in the third quarter. Guard Shay Hagans had a lot to do with that, pouring in a team-high 26 points and counter-punching Pitts and the Vikings whenever they scored. She was a big reason the Jackets kept the game within a possession for most of the final quarter. Osbourn Park’s Sha’Lynn (Shay) Hagans (26 points) goes around the screen from Karissa Highlander. That’s when the Vikings got a lift from their bench. Dudley put freshman center Olivia Brooks in down the stretch and Brooks delivered in a big way. She scored on two offensive rebounds in a row under three minutes left to give her team a late seven-point lead. The Jackets battled back yet again, but late free throws by Pitts put the game away. 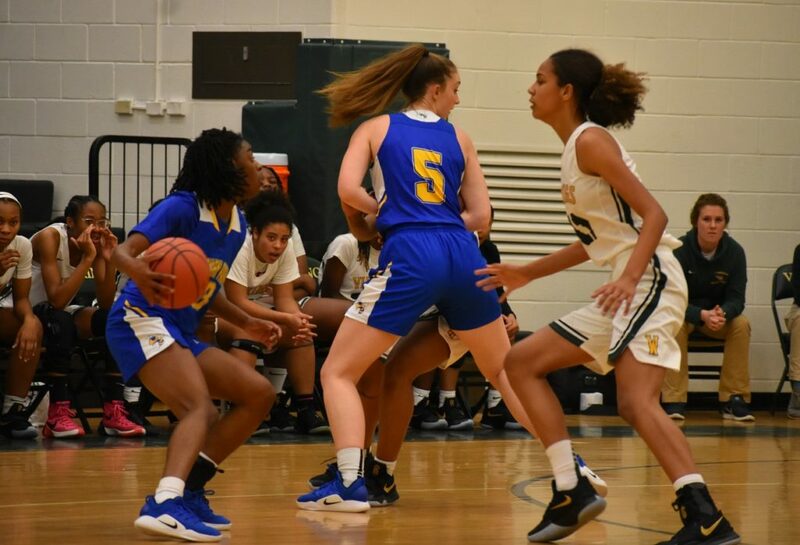 Woodbridge (2-0) also got strong contributions from Vanessa Laumbach (eight first half points), Willard (five assists), and Camryn Platt-Morris (eight points). Hagans and Osbourn Park (2-1) got help from frontcourt players Karissa Highlander (eight points) and Hannah Osaro (seven points, eight boards). Camryn Platt-Morris shows her defensive prowess on the ball against Hagans. Although in different regions, both teams are strong contenders and it wouldn’t be surprising to see them clash again down the road in the state tournament.